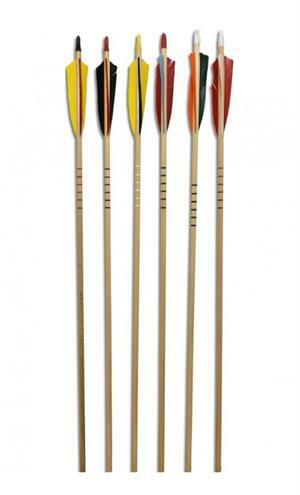 Home > Archery- Hunting, Target, Traditional > Arrows & Shafts > Arrows > Rose City Hunter Select Cedar Wood Arrows, dz. Item Number: Rose City Hunter Select Cedar Wood Arrows, dz. Select ... 5/16" - 30-35 lb. 11/32" - 40-45 lb. 11/32" - 50-55 lb. 11/32" - 60-65 lb. Fully clear lacquered arrows, Select cresting, Shield cut solid feathers, Bohning Classic Nock, full length premium Port Orford Cedar Wood Arrows. COLORS VARY, but each set is always matched per dozen.